Meng Qi Shi Shen is an adaptation of the Chinese web novel of the same title, written by Zi Yi 281 (紫伊281). 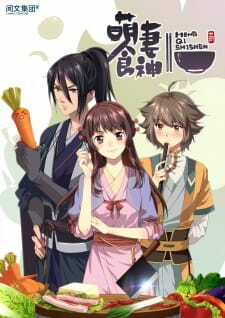 First this was my very first Chinese anime which I have watched sub by MizureX33 and I have found it weird but refreshing. It is quite similar with a Isekai anime except it is not fantasy based. Story revolved around the daily struggle after waking up in medieval China. Romance element had it quite touchy. Just give it a time to show color. The budget put into animation quality and graphical quality is pretty self explanatory, too bad the source material holds the art back. Its a rather straightforward work overall, you can see hints of its origins as a wuxia/xianxia if you're familiar with the genre, but the worst the original work was removed. The food and cooking is fantastic, with appropriate musical accompaniment. My only complaint is that there isn't enough of it. They barely manage a cooking scene an episode and its really the only reason to watch this anime. Really just nothing much in the writing at all. The first arc is an episodic isekai standard of getting to know the world, with a pretty unappealing romantic plot including multiple scenes of the heroine going "wow i really like this handsome guy" as he straight up threatens her. Its made more ridiculous when she actually has more chemistry with a character introduced in the second arc of the season (not that that's much of a romance either, its a low bar). The second arc sort of implies some dramatic plot points will be brought up but it goes no where as does the rest of the plot. The biggest issue is that there's no feeling of conflict, which is most likely because the original source material just lacked anything substantial. The first arc is never really explained properly, the conflict ending up pretty much just being a background detail. The second arc lacks any significant conflict (which is what i feel the series should have just been from the start, just an episodic cooking adventure). There's the overarcing drama, which is resolved unceremoniously with the sudden appearance of some goons, to generate a damsel in distress rescue. And there are 2 instances of cooking competition where they barely pretend that the heroine will lose. Overall its not like it isn't enjoyable, its easy to ignore the lack of any significant writing if you're just in it for the food scenes. There are some rather unfortunate stereotypical issues around playing character sexual orientation for comedy towards the end, which isn't great. Its a good effort on part of the production company and director for improving on what i would have considered an unsalvageable property.